„The only purpose of concentration-camp memorials is keeping guilty conscience alive…“ once a guy said to me, after I had visited former concentration-camp Buchenwald and told him about that. Well, it depends on you, whether you feel guilty or not. I don’t. The story of my family is pretty ambigous: My grandfather was arrested as a communist in Sachsenhausen for a few horrible months, but he survived. My step-grandfather was member of the Wehrmacht and joined the ‚Unternehmen Barbarossa‚ as a common soldier. Obviously he was involved in murdering Jews in the East of Poland, my mother told me about pictures of these atrocities he brought home. After being wounded he was commandeered as a guard of a small labour-camp in Berlin. During Soviet occupation he was deported in May 1945 and shot in Brest/Belarus. 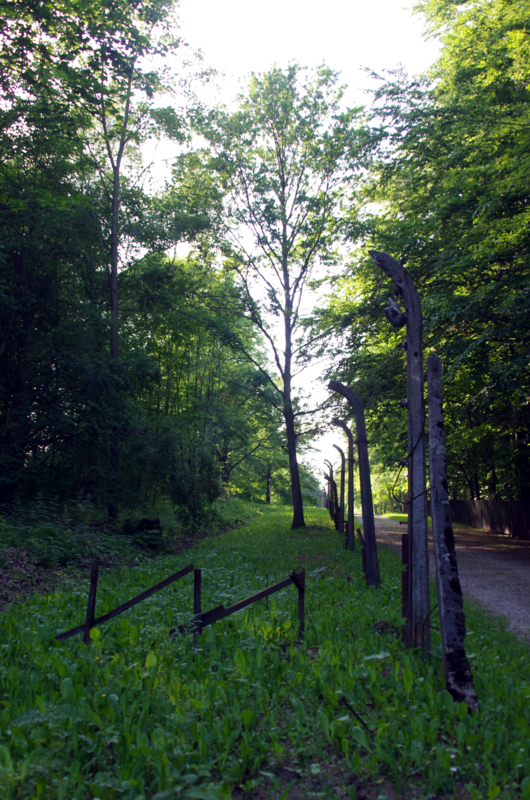 Remains of former electrical fence of concentration-camp Buchenwald. So what? I don’t feel guilty, but I do everything I can, that this situation of perverted law, inhumanity and cruelty will never come back to Europe. What happens in Ukraina these days makes me sick, but it reminds me, that peace is fragile all the time. You have to work to keep peace, and memorials of concentration-camps helps with this matter.